Wader Quest: 'STOP Shorebirds from dying'. BirdLife Australia appeal and Farewell Shorebirds project. 'STOP Shorebirds from dying'. BirdLife Australia appeal and Farewell Shorebirds project. Imagine how tired you would feel if you had to make the incredible non-stop flight from Alaska to Australia like Bar-tailed Godwits do. It would be the equivalent of you running a marathon, non-stop for 9 days at 53kph the whole way with no food, water or rest. Some feat! Bar-tailed Godwits obviously arrive in Australia after such a journey exhausted and very hungry, they will have lost 50% of their body weight along the way. 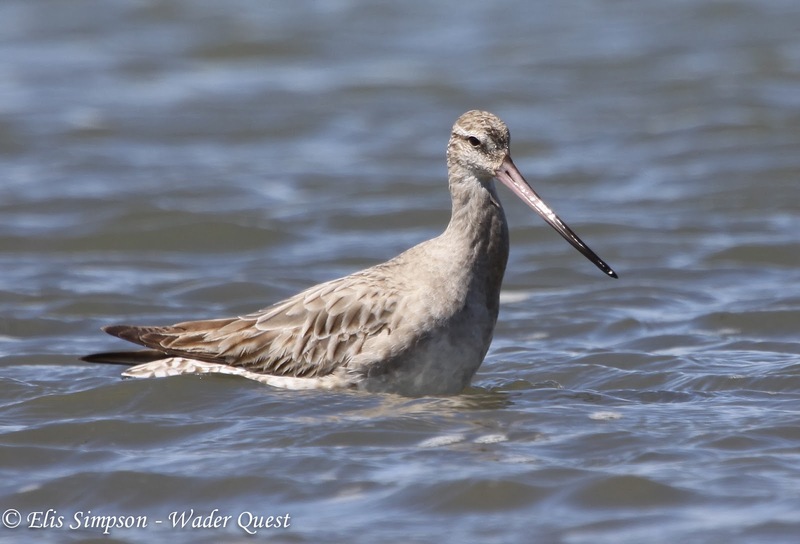 This Bar-tailed Godwit was photographed in New Zealand just after it arrived from Alaska. Notice the drooping wings which will have been in motion for the last 8 days with pause. Obviously they will need to rest and feed and that is why, like wetlands everywhere, Australian wetland habitats are crucial for these and many other species of wader. The problem is that the wetlands they rely on have been disappearing or are increasingly threatened by human development. For example; the coal loading terminal in the Hunter Estuary in New South Wales which, if it is allowed to go ahead, will destroy irreplaceable intertidal mudflats; the over extraction of water at Coorong in South Australia is turning shallow marshes into saline wastelands; roosting sites are being depleted by residential and tourism developments due to the build up of housing and recreational centres in the Great Barrier Reef Coastal Zone. All this is happening despite some supposedly being afforded some sort of protection as RAMSAR sites. As we have often said, and will repeat many times more I feel sure, the problem is that each site is assessed on a case by case basis. The thinking is that in each case 'only a small part of the habitat is being lost and there are still many shorebirds around that can go elsewhere, so the effects are minimal. The problem is that when this happens time and time again the cumulative effect can be devastating however small or insignificant they may each appear on the face of it.. We believe that every piece of wild habitat that still exists is important and should be fought for vigorously, that is why Wader Quest has been set up to support local community conservation projects in the hope that the cumulative effect of these small positive impact projects will at least mitigate the damage being done by so many negative impact projects. Bar-tailed Godwit, Limosa lapponica baueri. Godwit numbers in Australia are down by 50% on average during the last 27 years. Some regions are harder hit than others, in Gulf St Vincent for example they are down by 78% between 1981 and 2004 and by 68% in Moreton Bay in Queensland between 1993 and 2008. As if this were not bad enough, the Yellow Sea region, which they rely on for their return journey, is being destroyed at an incredible rate by land reclamation, the most famous example being the Saemangeum seawall in South Korea which killed hundreds of thousands of migratory birds most noatbly Great Knots of which around 90,000 disappeared. BirdLife Australia has an appeal called STOP Shorebirds from dying and is seeking help to fund the campaign. The money will be used to fund research and monitoring of the birds, vital information which is needed to fight decisions that threaten the birds. Without this kind of monitoring we would not know about the plight of the godwits in Australia and many other waders around the world. The information has already been used to gain Vulnerable to Extinction status for the Bar-tailed Godwit in Northern Territory and Western Australia and it is listed as Rare in South Australia which helps in the campaign to save them from further threats. While others play down the impact of development, BirdLife Australia and many other organisations across the world including Wader Quest, armed with this knowledge, are able to raise awareness and produce policies to protect wetlands and working together can campaign to protect wetlands from a 'death by a thousand cuts'. This is a project to raise awareness about waders across Australia. BirdLife Australia encourage people to celebrate the departure of the waders for their breeding grounds, to wish them well and hope that they have the strength, against the odds, to return after the breeding season bringing their offspring with them.